Mr Yotsawat has high hopes for contracts from the EEC, as well as infrastructure projects across the country. Sany Thaiyont Co, an importer and distributor of Chinese construction machinery, expects 2019 revenue to double to 2 billion baht from demand in the construction sector, driven by the government’s megaprojects. The company expects to sell 720 units — 600 excavators, 50 road rollers, 50 wheel loaders and 20 pile drilling machines to construction companies. Managing director Yotsawat Ruangraklikhit said Sany Thaiyont has high expectations for the government’s Eastern Economic Corridor scheme, including five megaprojects and other infrastructure projects across the country. “Many projects will start to disburse the state budget and sign contracts for construction,” said Mr Yotsawat. 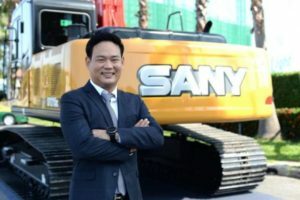 For 2018, Sany Thaiyont is confident revenue will rise 100% to 1 billion baht and construction machines for the period stand at 1,000 units sold, doubling the initial projection. “We can compete with other inter-brand rivals, even though our products have to be imported. We have a strategy to market constructed machinery locally,” Mr Yotsawat said. Shanghai-listed Sany Heavy Industry entered the country in 2008 with the establishment of Sany Heavy Industry Thailand to import products to be sold locally. Two local firms distribute Sany’s concrete-mixer trucks and cranes — Siam Sun Autosales and MaxCrane Machinery. For excavator products, Sany formed a joint venture called Sany Thaiyont Co with the Ariyawutiphan family. It has registered capital of 198 million baht, in which Sany has a 51% stake, with the rest belonging to the Ariyawutiphan family. The Ariyawutiphan family runs Thaiyont Tractor Co and Thaiyont Equipment Co.
Mr Yotsawat added Sany Thaiyont plans to spend 200-300 million baht in 2019 to expand service centres, employ more manpower and provide financial solutions for customers. It will develop seven service centres across the country. Sany Thaiyont has five service centres in Bangkok, Khon Kaen, Phitsanulok, Lampang and Nakhon Sri Thammarat. Wang Lizhi, executive director of Changsha-based Sany Heavy Industry, said the parent firm is focusing on Thailand, Indonesia and India because these three markets have high potential in Asia-Pacific. Each government has injected an investment budget for infrastructure projects to drive its economic fundamentals. “Last year, Sany sold 47,000 excavators worldwide,” Mr Wang said. Sany expects 1,000 units to be sold in Thailand, 1,100 units in Indonesia and 3,000 units in India in 2018. Sany set an ambitious goal to sell 2,000 construction machines in Indonesia and 5,000 units in India by 2022, but expects flat growth in Thailand in the next couple of years. Mr Wang said Sany has put off its plan to construct a manufacturing plant in Thailand because of an exemption of import duties under the Thailand-China free trade agreement. Earlier, the parent firm announced a five-year plan in 2009 to invest US$40 million (1.31 billion baht) to construct a manufacturing plant in Rayong’s Amata City Industrial Estate to be a hub for Asean.